'Cossimundia Ghaut Benares'. 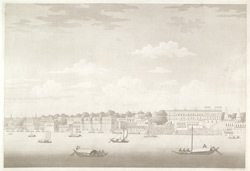 Aquatint, drawn and engraved by James Moffat, published Calcutta, undated. bl.uk > Online Gallery Home	> Online exhibitions	> Asia, Pacific and Africa Collections	> 'Cossimundia Ghaut Benares'. Aquatint, drawn and engraved by James Moffat, published Calcutta, undated. Aquatint with etching of a ghat at Varanasi by James Moffat (1775-1815) published in Calcutta in 1804. Varanasi (Benares) is situated on the west bank of the River Ganges. Founded in the sixth century BC, Varanasi is one of the seven sacred cities of Hinduism. The waterfront is lined with over hundred ghats where residents and pilgrims come to perform their ablutions. This area is known as a tirtha, or ‘crossing place’ which allows the devotee access to the divine and where gods and goddesses can come down to earth. James Moffat, a Scotsman, was based in Calcutta from the age of fourteen and is thought to have learnt his trade as an engraver in the city. He produced a number of views along the Ganges.